A 16-year-old boy has been stabbed to death in a park in Birmingham. He was found in Sara Park, Small Heath, at about 20:00 GMT on Wednesday and died at the scene. Another boy, aged 15, suffered minor injuries in an attack at the park, in Herbert Road, West Midlands Police said. A murder investigation is under way but no arrests have been made. The boy is the second teenager to be stabbed to death in the city in a week. The latest fatal attack came seven days after Mohammed Sidali, 16, was stabbed outside Joseph Chamberlain College in Highgate. Birmingham Yardley MP Jess Phillips said she wanted an emergency meeting with Home Secretary Sajid Javid to discuss the spate of knife crime. 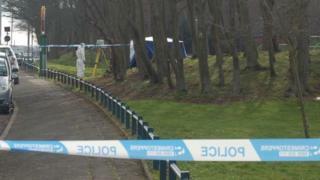 The park was cordoned off and forensic officers were at the scene. Councillor Zaheer Khan, whose Small Heath ward borders the area, said the boy's "tragic" death represented "another victim of knife crime". He added: "I feel that lack of police resources means people believe they can do whatever they want." Mark Crooke, the chairman of Pritchett Tower residents' association, said: "Today is a sad day because of the young man losing his life. People are feeling very vulnerable and scared. "People that live in this area are becoming very scared and a lot of people want to leave." Two streets away from the park, in Coventry Road, a 22-year-old man was stabbed in his back on Monday. The stabbings are not thought to be linked. Police said the man's condition was not life-threatening and an 18-year-old arrested on suspicion of wounding had been released pending further inquiries. She said: "I have a son and I really fear what is going to happen to him. "Last week, we had that young lad who died at Joseph Chamberlain, and another stabbing up the road. It's a joke. "Is it safe where we're living? It's such a shame." A 60-year-old female resident added: "There is stuff happening around here all the time. There is no police presence here." Det Ch Insp Edward Foster, from the homicide team, said: "A teenager has sadly lost his life and another was assaulted. "We are working hard to establish the circumstances around what happened." Birmingham City Council said its officers visited residents in Small Heath on Thursday, listening to concerns and offering reassurance, alongside partners including West Midlands Police. Cabinet member for social inclusion, community safety and equalities John Cotton said: "Birmingham Youth Service runs programmes around youth violence - including schemes in Sparkbrook, South Yardley and Small Heath which seek to challenge and prevent knife crime."